AlphaNinja - At the risk of sounding repetitive, there's a REASON these folks are selling. AlphaNinja recoiled at the first-day valuation accorded this stock, and others have started to notice as well. Remember, this company sports a market valuation around $600million, nearly 4times the company's total addressable market (TAM, if you're fancy). The I.P.O. market “has not and should not see a pricing” like OpenTable’s, which reminded him of the dot-com bubble, he said. “People don’t truly know the story here about this company. It’s a one-trick pony company,” he said. 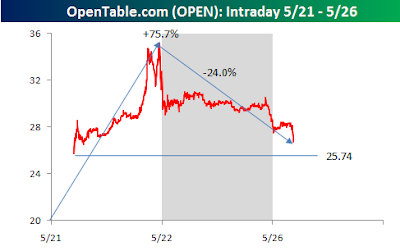 OpenTable has lots of room to grow in the near term and revenue is now growing about 20 percent a year. But that growth will reach a cap, Mr. Sweet said. The company makes money selling its software to restaurants and charging them $1 for each diner seated. They have 10,000 restaurants on the system and estimate that there are 30,000 restaurants that take reservations in North America. Even if they signed up all the restaurants, revenue, now $56 million, would top out at about $160 million. Furthermore, as the company acknowledged in its filing with the Securities and Exchange Commission, restaurant reservations are dropping. “Pricier restaurants in San Francisco, Tampa, New York are not that hard to get in right now. In fact, one can do it themselves if they choose, with 15 minutes notice,” Mr. Sweet said.